I am knitting my husband a sweater vest in charcoal gray. Having a simple stockinette project, that I have long wanted to make has been so good right now. We just moved and setting up house is happy but intense. Sitting down to the peaceful rhythm of this vest at the end of the day has been very soothing. It has likewise been good to have something fun and engaging to read. 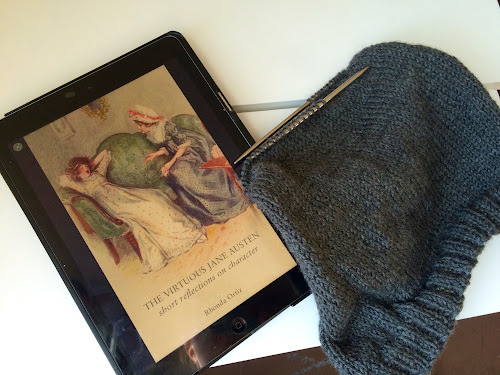 I just finished The Virtuous Jane Austen: Short Reflections on Character by Rhonda Ortiz. Reading this book has been like being with the best company, "clever well informed people, who have a great deal of conversation" (Persuasion). What could be intellectually better than an engaging discussion of Jane Austen Characters that incorporates virtue? For me, not much! Rhonda knows the novels well and can easily discuss themes across them. I like that her essays are character studies because therehere is so much to learn from each of Jane Austen's carefully crafted characters. I enjoyed hearing Rhonda's perspective so much, her writing made me see and consider things that I had not before. This book is well worth the read! I will be linking up on Small Things and Frontier Dreams. I really want to make a vest for my husband someday soon. I like the color of the yarn you are using.